countries, celery stalks are replaced with ribs and egg yolks are added. The Holocaust was devastating for the Jewish community of Antwerp. According to estimates, about 65% of all Jewish people died in the Holocaust. 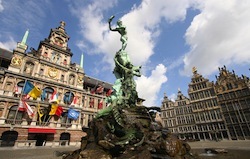 At the start of World War II there were around 35,000 Jewish people living in Antwerp and only 15,000 after the war. Prepare chicken leg quarters by cutting them in half. Chop carrot, leek, celery ribs and onion in large chunks after cleaning. Place a large stock pot on the stock and pack vegetables in the bottom of the pot. Lay chicken on top of the vegetables. Pour in the 6 cups of chicken broth. Heat the broth to boiling and cover partially with the pot lid. Spoon egg yolks into the bottom of a large soup bowl. Pour soup over eggs and stir constantly to incorporate. Top each bowl of soup with parsley.